i have been so bad at art posts lately, and i'm going to try to be better about it! i have been planning to share this very special artist all month, but somehow have had so many other things to post about i didn't have a spot for her. but enough is enough, you all need to know faith ringgold. i hadn't heard of faith ringgold before i interned at the national museum of women in the arts. on our first day in dc, jarman and i visited both places we would be working at that semester. when we walked through the museum, there was an exhibit on ringgold's works. i could immediately tell they were political, so sadly i walked right past them. i always insist to jarman that i hate all things political, so i had to make the point that i also didn't like political art. on my first day of work at the museum, i attended a lecture on faith ringgold and my eyes were opened. her works are truly important in our country's history, and sadly there are many people that don't know about her. many of her works still haven't been purchased by museums because of their controversial yet blunt connotations. i am seriously embarrassed that i had the gall to walk past such honest works, and have learned a lesson. 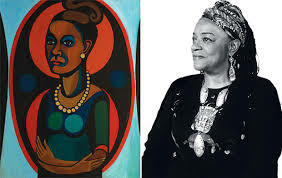 faith ringgold started painting in the sixties. think about that for a second- she was a black woman painting during the civil rights movement? do you think she was respected or heard? absolutely not. but she continued to paint and show her side of the story. she approached other black painters at the time, but they didn't respect her as a female artist. she finally got a big break and was given the opportunity to paint in a large studio, while her children lived with her mother for the summer. this was when she created her largest works, and pulled out all the stops. her early works (like these paintings) are actually her least popular. later in her life she began making story quilts and children's books that are much more well renowned. this piece is my favorite of her early works. it is so bloody and scary, but has so many great connections to the art historical past while showing something new. she clearly pulls from picasso's famous work guernica with the black and white boxy background and planar arrangement. the subject matter also matches picasso's work, which shows the effects of war on the population. i also feel like she was looking at the many paintings of the taking of the sabine women- the ancient story of the roman men stealing the sabine women for the empire- with the men and women fighting and the children looking directly and cautiously out. because the painting is not confined to the canvas- people's bodies literally spread across the edges- i think it is almost frieze like. in greek and roman temples the frieze was a continuous relief sculpture above the columns and went all the way around the temple, often showing a battle between centaurs and humans, amazons and humans, etc. like a frieze, ringold's scene spreads past the canvas, which shows that racial battles spread across the united states. lastly, her title evokes an interesting meaning as well - ringgold was working during the sixties, a time when minimalism reigned and figuration was no longer scene. her works show more than the human form, they show the angst of a nation. in 1962, just a few years before this work was created, tony smith created his famous 6'x6'x6' metal cube and titled it die. while his work has lots of it's own evocations, it fails to show the state of the united states social upheaval. 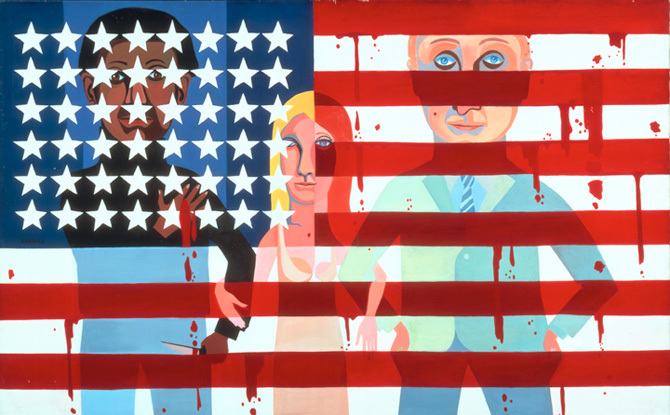 ringgold's painting, though scary and at times hard to confront, is an honest portrayal of our countries past, and truly shows her side of the story.